What is Physical Therapy Billing Software? After you document the services provided for a patient, the billing software can obtain the charges from your documentation, generate the correct billing code, and produce a bill for that patient. Depending on the software, you may have the option to submit charges ‘in house’ or outsource the billing to be handled by the billing software team. Does the company have dedicated support specialists available to call if you need to make a correction or file an appeal from insurance companies? Don’t underestimate the value of a good support team – keep this in mind when deciding between options. Many Physical Therapy EMRs include a billing software component, which makes life really easy in terms of documentation and billing. However, if you choose to use a separate PT billing software, make sure it can integrate with your documentation, scheduling software, and other clinic servicing programs you use. It sounds painfully basic, but specifically ask if the software is compatible with your current system. The first question most clinic owners ask is: How Much Does PT Billing Software Cost? It’s very common to find pricing models based on percent of revenue collection. Expect to pay between 6% and 12% of your monthly revenue collected if using an outsourced PT billing collection service. If you decide to process collections in house, the software may only charge a monthly fee to use the software; however, you’ll still need to consider the cost of paying internal staff to manage your billing. You can’t manage it if you don’t measure it. A good therapy billing software will provide reports such as patient cancellation/no show rates, full financial reports (receivables, claim status, etc), claim status report, and productivity measures. The right reports can help make your clinic even more efficient. Just be careful not run down a rabbit trail of reports – find the ones that contribute to the bottom line and make them your focus. 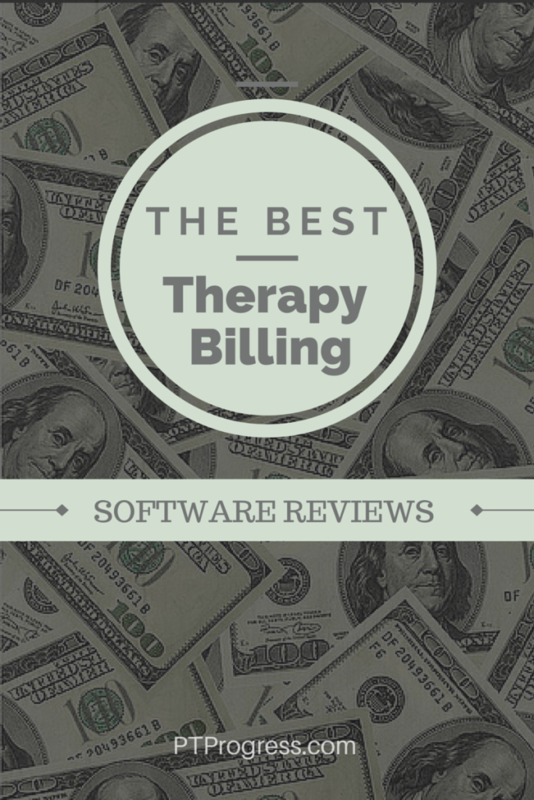 Now that you know what to look for in a therapy billing software, take a look at the detailed reviews of these Therapy EMR software and billing services. Read the reviews and add your own if you have used one of these providers. "Fast and Easy Daily Notes"
"Cuts note writing in half"
WebPT has over 40,000 members and is one of the fastest growing medical records companies in the U.S. A leader in EMR, billing, and practice management solutions, WebPT is known for its customer service and intuitive cloud based software designed for physical, occupational, and Speech therapists. Over 7,000 clinics use WebPT, which boasts an impressive retention rate of 99.6%. The cloud-based system allows clinics of any size to have anytime access to their medical records from any web-enabled platform. WebPT’s cloud based therapy software saves clinics the cost of third party IT support, expensive server management, and technology overhead. The WebPT platform integrates documentation, scheduling, managerial reporting, and therapy billing. The platform was built by PTs for PTs, which is why the streamlined workflow helps to improve efficiency and profitability in the clinic. Custom reporting allows for managers, owners, and therapists to track measures such as productivity, patient cancellations and no-shows, referrals, and claim submission status. WebPT offers billing support that helps to reduce claim errors, speed up claim submission, and maximize your clinic’s revenue. WebPT is known for being user-friendly, affordable, and a leader in mobile platforms. Therapists who use WebPT can focus on patient care knowing that the documentation and billing details are fully supported by an state of the art EMR. "Simple to Learn and Use"
"Reports can be improved upon"
"Waiting for customer service follow up"
"Excessive features and occasional bugs"
“Focus on patients, not paperwork.” Specifically built for small practices, Kareo is used by physicians, therapists, and clinics who want an all in one solution that is seamless. From scheduling and billing to notes and charges, Kareo provides an intuitive interface that is easy to use and implement in any clinic. Kareo has no contracts and no set-up fee, which makes it one of the most flexible options available today. For physical therapists, Kareo integrates with WebPT as a Certified Billing Partner. This means that if you use Kareo for a billing service, it can easily become integrated into the WebPT EMR, giving your practice the best of both worlds. The Premier EMR for Therapy. Known for its comprehensive management solutions for therapists, Casamba integrates documentation, scheduling, billing, and financial reporting into a seamless system specifically designed for therapists. In over 7500 facilities, Casamba is a leader in therapy software for both small and large practices. Casamba includes multiple outcome measure libraries, dashboard and analytics reports, as well as custom interfaces to suit outpatient, home health, skilled nursing, and other facilities. I found all documentation (evals, session notes, discharges) to be extremely difficult with Casamba and took 2-3x longer than other medical record software I've used in the past. Casamba has very poor UI/UX, is full of bugs, crashes often and creates extra work for therapists. Avoid. This software is full of glitches. They keep coming out with update that make the program worse. The problem is it looks good and you don't find out how unfriendly it is to the user until they are so wrapped into you business that it would take a fortune to untangle yourself. Casamba is absolutely the worst software out there!!!!! “Feature Rich, Yet Affordable” TheraBill excels as a company that provides electronic documentation, scheduling, and insurance claims within one package. The cloud based software allows you to manage your practice anywhere you can get an internet connection. From secured faxing to patient invoicing and reminders, TheraBill boasts a hefty list of features that are tailored to the needs of real therapists. With integrated billing and scheduling, there’s no need to create a superbill anymore. Scheduled sessions are entered into the schedule, documented, and are made available for billing immediately. TheraBill offers a 30 day free trial to explore all the features they provide. With flexible pricing plans, you can start for as little as $50 a month. ClinicSource is a cloud based therapy practice management system with integrated EMR software, making it an all in one solution for therapists and clinic owners. With ready to use templates for SOAP notes, treatment plans, patient goals, and evaluation forms, therapists can focus on treating and use the streamlined software to handle billing, scheduling, and reporting. One unique features of ClinicSource is the ability to scan and upload and patient file for evaluation, treatment and other records. Once uploaded, anyone can view the attached documents. ClinicSource provides a free demo and a 30-day free trial. With multiple pricing packages, ClinicSource ranges from $79 a month and up based on the number of users in the system.